My mother Jane Wren passes on, a great loss. 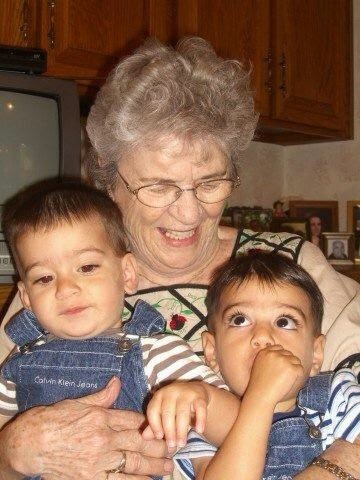 Mom with grandsons Jeffery and Tyler. Photos of mom's 88th birthday below. At 7:50 a.m. this morning my mother Martha Jane (Edwards) Wren passed on. She was 89 this past July. Mom told me she was born in Cave Springs, Arkansas where her parents F. Lee and Myrna Edwards knew a doctor, but she was really from Amarillo, Texas. Her dad was a very talented salesman but not a great father. Her mother supported the family after Lee died in 1946 with a beauty shop she had always had in her home where Mom grew up, 826 Florida. Mom was a cheerleader and a good student at Amarillo High School, where she met my dad, John E. Wren, who was a year ahead of her. Her senior year in high school (class of '43) she was elected school queen in the fall and most popular in the spring. She was awarded a full scholarship to Colorado Women's College, but chose to instead attended business school in Amarillo until dad was discharged from the Navy and they married March 16, 1945. In 1949 we moved to Colorado where mom and dad started Western Merchants Wholesale Company which they sold in 1969. Mom and dad had a close circle of friends, the Cearly's (Ann was mom's best friend I imagine), the Herren's, the Smith's, the Joy's, the Deeb's and others. They played bridge each month and dad and his buddies had a poker game most months. They were members of the Valley Country Club and founding members of Pinehurst Country Club, the 26th Club, Mount Vernon Country Club, and the Denver Athletic Club, and Wilshire Presbyterian Church. They traveled in all parts of the US and the world. who also belonged to Pinehurst Country Club and had a condo on the 11th fairway, as did mom. Ernie died a few years ago. They were both avid golfers and travelers. I had the rare privilege of attending her 50th high school reunion with her and it was clear she was still the most popular with her many class mates of that greatest generation. Mom was a great business woman, I don't believe dad would have been nearly as successful without her, a great mother, we always had clean clothes, a clean house, and a great dinner on the table at 6 p.m. She was an extraordinary grandmother to her 7 grandkids. She was a life long Presbyterian, and for the past 20 years she read an Alanon daily reading book almost every day and marked the page with the year. God bless you Mom, thanks to you and dad for all the good memories. We had no idea this would be the last real celebration of mom's birthday a year ago. On the cake was a photo of the house in Loveland when we came to Colorado in 1949. Mom with granddaughter Monica celebrating her 88th birthday a year ago last July.